As sweet as cinnamon: No Sound, Willow and a Peak! Today I have been very quiet....I have lost my voice... do you have it?... I sound like Bonnie Tyler... like another one of the gum nuts..Lol.....But I have had some time to do some sewing....I have almost finished my Christmas project for the 'Among The Gum Trees' blog... have you been visiting the blog to get your free designs each Monday and to catch up on the latest news. Here is a sneak peak for a project I am working on... a little project... but very cute....any guesses? This is Willow...it is just beautiful! Do you love to go to a quilting workshop? With all that yummy fabric...oh just pure delight. Your sneek peek has me intrigued. I'll just have to be patient!! I'm so jealous of you doing a workshop with Kellie. I just love her work. Do enjoy. Poor you. I hope you have enough voice to be able to chat at your workshop. The Willow design looks so gorgeous. I am going to a workshop this Saturday. I try to do as many as my shifts will allow as I don't have any local groups to go to. It is fun just being with like-minded people and like you, sometimes the project gets finished straight away, sometimes not. Look forward to your Gum Tree project on Monday. Love your sneak peek! Enjoy your workshop with Kelli...you are soooo lucky. Wish I was there! Rula must have caught it from you as we have a Bonnie Tyler soundalike here too. Seriously, hope you feel better soon. The little section of your project is very teasing. I love your fabrics and those DMC candy striped colours are delicious. I love the greens and the pinks and plums oh and the Autumn golds and oranges....anymore, now let me think....haha! Enjoy the workshop, it sounds as if it will be full of fun. I hope your voice gets better soon - no fun! Your little sneak peek is very intriguing, but I have no guesses at this time. Lucky you! 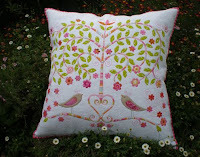 I would love to go to one of Kellie's workshops - just love her designs! I try to go to as many workshops as I can - its always fun learning new techniques, and meeting new people for inspiration. I'm going to a retreat this weekend - quite looking forward to it! Your voice must need a rest. If you're anything like me and talk too much. LOL Can't wait to see your new design. I love Kellie's patterns, just beautiful, wish I were there to attend the workshop with you. What fun. Enjoy your time there and hope you share it with us. Oh no, I hope you get your voice back for the workshop! I love your sneak peek and can't wait to see the finished project! I'm SO jealous that you get to take a workshop with Kellie. I love her stuff. I've never been to a workshop OR a class. I hope you have a wonderful time and that you get to chat with everyone - have some tea with honey and lemon, lots of it to help your throat! I hope you feel better soon darling! I have just completed my workshop with Kellie - the two days were separated by four weeks! It was great! A little tip though - make sure you get a really good basting spray. I tried two before I hit jackpot with Victorian Textiles 505. It makes the world of difference. Have a wonderful time and be ready to share some little tips when you come back, ok!!? I hope your voice is back and you had a great time at the workshop .